6/7/13 Although most details of the investigation into the deadly 2009 shooting spree at a Tel Aviv gay youth center are still under a gag order, it can be reported that the two people killed, Liz Trubeshi, 16, and youth counselor Nir Katz, 27 did not know the murderer, and died simply because they were in the wrong place at the wrong time. It is believed that the man who pulled the trigger was a hired gun who, when he did not find his target at the Bar Noar youth club, opened fire indiscriminately, killing Trubeshi and Katz and injuring dozens of others. While only one killer came to the club, police reportedly believe that at least two more people conspired with him and came to his aid afterward. All three are known criminals, with the killer and at least one accomplice being "soldiers" in a large, central Israeli crime organization who have been interrogated since the Bar Noar killings for arson and assault, police said. The fourth, most recent arrest in the case is apparently of an activist in the gay community. He has been detained for allegedly knowing the motive for the murders and obstructing the investigation by not sharing that information with police. It is believed this individual is directly connected to the motive, and that he was the target of the assassination, which involved revenge. The gag order prohibits making the motive public at this time. The activist is known to support young people in the gay community and help them with decisions regarding their sexual identity. Three other suspects were arrested in connection to the murders themselves on Wednesday. All four suspects appeared before a Tel Aviv court on Thursday, a day before Tel Aviv's annual Gay Pride Parade. The court extended the remands of the original three murder suspects by 11 days. The gay activist was remanded for another four days. All of the suspects deny any connection to the killings. The initial three suspects are all Jews between the ages of 20 and 40 who live in central Israel and have known each other for years. Tel Aviv police commander Bentzi Sau explained that police still have much work to do, and that he does not yet want to release additional details. During the four years police have been investigating the Bar Noar killings, the probe went in a number of directions, until a few months ago the Tel Aviv Central Unit detectives handling the case caught a break: Information pointed to new suspects who had not previously been interrogated, at least not in the Bar Noar killings. The Central Unit knows the suspects from various criminal activities. Members of the family of these suspects are also alleged offenders. In the past one of the women in the family was connected to an affair that shocked the Israel Police. Tel Aviv Central Unit detectives launched an undercover investigation, and now believe they have enough evidence to charge the suspects. After the August 1, 2009 killings, the Central Unit was given an unlimited budget to pursue the case, and the investigation turned into one of the most expensive ever carried out in Israel. Anyone who was mentioned in connection with the shooting was called in for questioning, and ultimately more than 1,000 people were interrogated. A break occurred recently when police found a pistol that they suspect was the murder weapon. Katz's mother, Ayala, said she had mixed feelings on hearing of the arrests. "It's not easy - it brings us back to that day," she said. "And it doesn't change the fact that my son is gone." Moreover, she added, while she hopes police have indeed caught the murderer, "questions still remain at this stage." MK Nitzan Horowitz (Meretz), who is himself gay, welcomed news of the arrests. "The unsolved slaughter at the Bar Noar has cast a heavy shadow for almost four years, not just over the gay community, but over Israeli society as a whole," he said. "Reactions to the murder by various people revealed the depth of hatred toward the gay community. ... I hope law enforcement authorities have indeed succeeded in catching those responsible for this terrible act." The murder took place on a Saturday night, when the club, located at the corner of Nahmani and Ahad Ha'am streets, was holding an event. The murderer, who was wearing a stocking mask, appeared in the doorway and began shooting in all directions. He fled, leaving no clues to his identity. "At about 10:40 P.M., someone all in black arrived," one of the teens who was wounded said on the night of the shooting. "He had a black mask and black clothing. I thought it was a joke, but he immediately began to shoot." The club is very small, he noted. "There's a balcony outside, but anyone who's inside has no place to run. People hid under the bed and the tables, but there were no shouts. I hid under a table with someone else." Over the ensuing four years, police conjectured repeatedly that they had found clues that would lead them to the murderers. Once was in October 2009, when the Shin Bet security service arrested Jewish terrorist Jack Tytell, who was convicted earlier this year of murdering two Palestinians in 1997, attempting two other murders and committing various other crimes. Tytell initially told his interrogators that he had committed the Bar Noar murders. But after repeated interrogations, police concluded he actually had nothing to do with the attack. Another false alarm came in December 2009, when Public Security Minister Yitzhak Aharonovitch announced that police had uncovered a lead that could solve the murder. But a gag order was slapped on the details, and what that lead was remains unknown to this day. 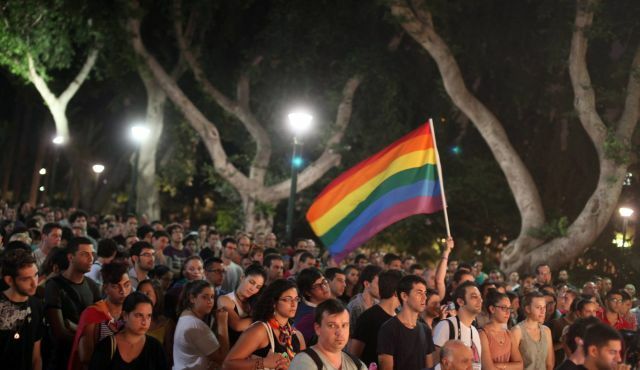 Meanwhile, the bill to compensate the victims of the Bar Noar shooting, on the presumption that it was a hate crime against gays, has garnered widespread political support across the board - but the solving of the crime could hurt its chances of passing into law. The bill, which mandates special support for the victims of the killings, was proposed by Health Minister Yael German (Yesh Atid) and signed by 26 MKs from Likud-Beiteinu, Yesh Atid, Habayit Hayehudi, Hatnuah, Meretz and Hadash. Haaretz has learned that German has decided to wait for developments in the investigation before bringing the bill to the Ministerial Committee on Legislation, owing to her judgment that the bill might not be necessary if the motive for the shootings turns out to have been, as police believe it was, a personal vendetta.